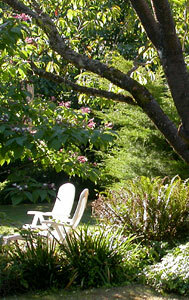 Practicing as arborists for over 18 years, we developed a passion for trees. But we know that not everyone who loves trees has the background to select the healthiest tree, the tools and desire to do the digging, or the know-how to guide a young tree's growth to give it the best possible start. The desire to provide our expertise to others brought TreePlanter.com's tree planting service into being. I will personally pick your new tree for quality, health, size, and structure. Bring the tree to you and plant it correctly. You will receive explicit instructions on how to care for your new tree. We are available to answer your questions, before, during, and after you new tree is planted. Finally, you have the security of our guarantee. We are equipped for any jobsite, and are licensed and fully insured for your protection. Trees are amazing, not just for their beauty in the landscape, but for their tenacious ability to survive the elements, how they provide habitat for wildlife, and their amazing ability to transform sugars and needed nutrients from the sun via photosynthesis. There is nothing that pleases us more than seeing a tree that we've planted grow over the years. Let us help add healthy trees to your environment. Order right here on the website, or give us a call for further information. "I cannot recommend Jason Stein and his company highly enough. He is honest, knowledgeable and diligent. He takes great pride in his work, and his attention to detail is excellent. I should also mention that he is very reasonable in his fees." "In 2008 Jason Stein planted well over forty trees on our land and we are happy to say they have all done well. We personally have know Jason since 2002. We have used him for all of our arborist needs and to beautify the 10 acres we live on. It is with great pleasure that we recommend Jason Stein and his company."